Are our B-schools ready to ride the start-up wave? And the big churn in our mid-segment rankings. Last year, there was huge hype around ‘Make in India’. A year later, India Inc has somewhat tempered its expectations. Given that it seems like we are all now playing a part in a big sound-and-light production, what does one make of the noise around start-ups? Despite some mutterings of a bubble, most agree there is a new wave. This has had a major impact on industry as well as India’s business schools. A major part of the impetus for this shift from corporate jobs to start-ups is coming from the B-schools. This is a big universe of new ideas and a lot of fresh energy coming into the industry. What is helping this new phenomenon is the easy availability of guidance and handholding by experts and, most important, finance—thanks to the ever-ready band of venture capitalists and angel investors who are ready to back new, untried ideas. The business schools are thankfully aware of this development as most institutions are weaving entrepreneurship into their course curriculum to give support to young businessmen. 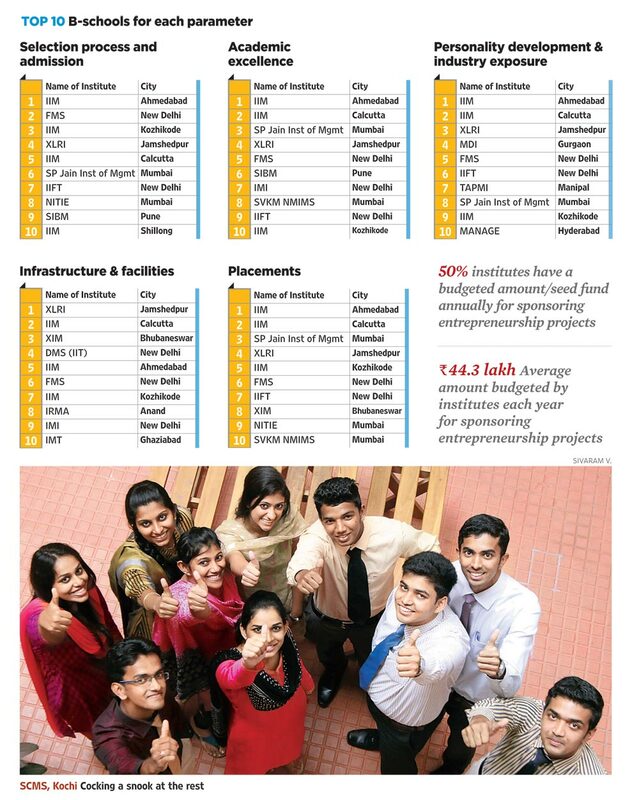 It is in this backdrop that Outlook presents its annual ranking of India’s 100 Best B-Schools (in association with our research partner Drshti Strategic Resea­rch Services). 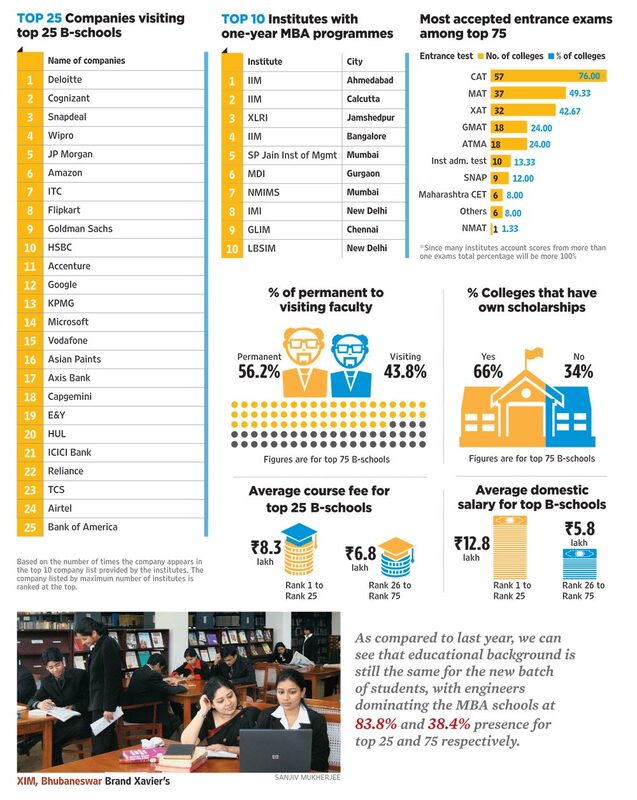 Like last year, there are no surprises in the top 15 as the rankings here remain more or less constant with little changing among India’s top busin­ess schools. The real churn is at the mid-level colleges, where some have improved positions by vitalising parameters. The churn at lower levels continues—there are many new names making it to the Outlook rankings this year. What is also visible is an overall imp­rovement in scoring by colleges, a trend that started last year showing that most colleges have got their act together and have been engaged in improving their systems. This is more visible in the lower ranks than in the upper ranks. Last year, looking at a good response in participation by B-schools to our survey, we had increased the list from 75 to 100. This year, following another round of good participation, we have maintained that. Considering all that enthusiasm in the start-up space, Outlook presents the ultimate guide to setting up a start-up. Beli­eve me, it’s a cracker. 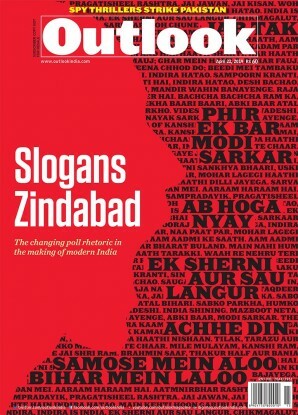 There are also sto­ries and columns that go deep into the issue of entrepreneurship. The global gurus spin wisdom, Steve Jobs is diss­ected, and we serve up an entrepreneurship quiz (give it a shot on pg 108). Given a scenario where B-schools are faced with new challenges, we look at the various issues facing them and how they are coping with the pace at which industry’s demands are changing. 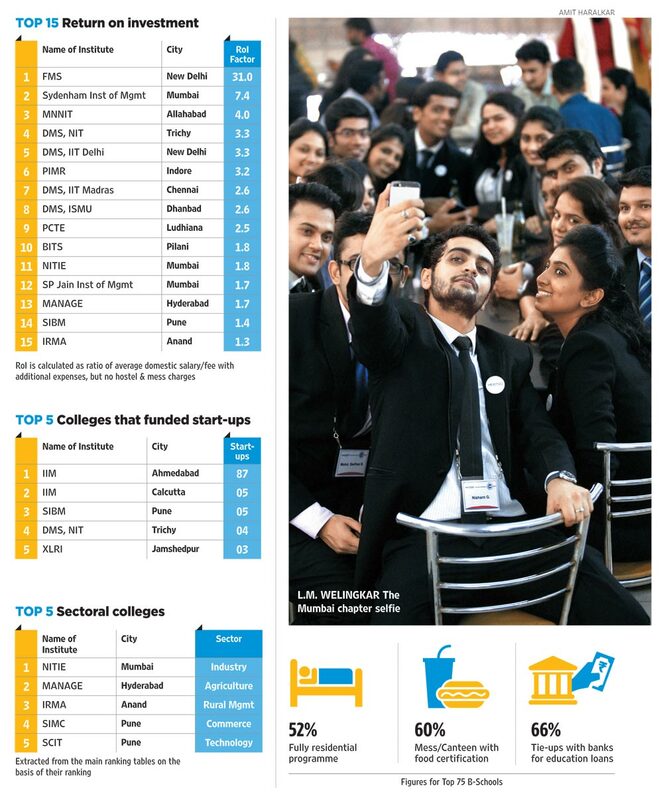 Start-ups are redefining rules in the classroom, and the B-schools are chan­ging too. Similarly, with the corporate sector constantly in the spotlight, we look at how the reservations debate in the private corporate sector has compl­etely died down. On the other hand, the Modi government is keen that the sector stop complaining and get down to doing what it does best—dreaming big, jumping in, taking risks. Is he, and RBI governor Raghuram Rajan, being unf­air to India Inc? We look at the facts. Actually, there will be many failures in this start-up game. That’s how the model works. But are Indians ready for this? 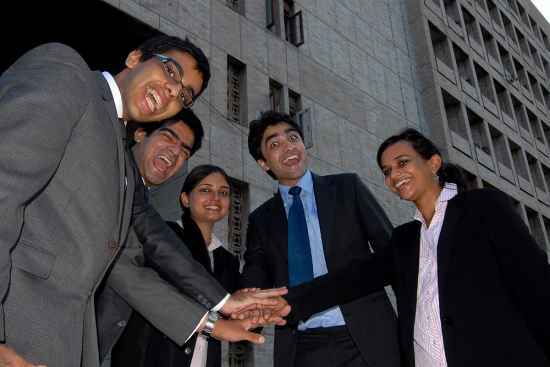 The students joining B-schools seem aware of the risks. Outlook’s pac­kage as well as its rankings assume special significance in such times and will help students take informed decisions. As always, choose wisely. 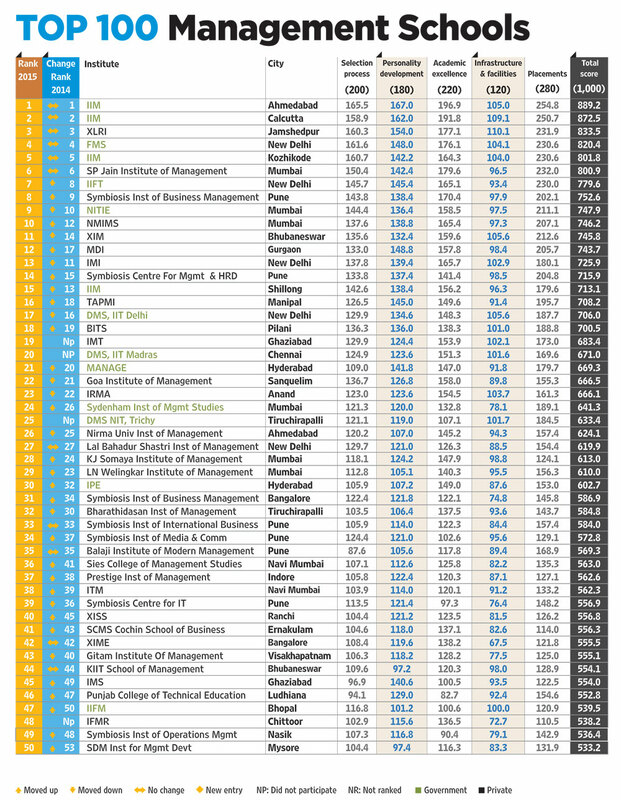 In the issue dated October 5, 2015, in the table for India's Top 100 B-Schools, Rank 62 and 72 should read as Jaipuria Institute of Management instead of Jaipuria Institute of Science. 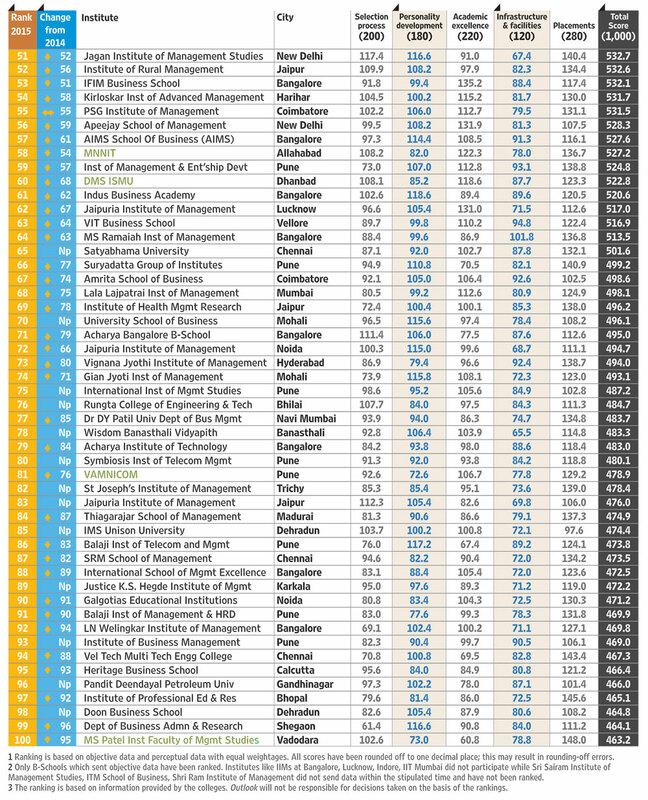 Similarly, Rank 93 should be Pune Institute of Business Management instead of Institute of Business Management. The error is regretted. In order to rank India’s best B-schools, Drshti Strategic Research Services (Drshti) designed a detailed, rigorous methodology involving inputs from all the stakeholders—B-schools, recruiters, faculty and students. 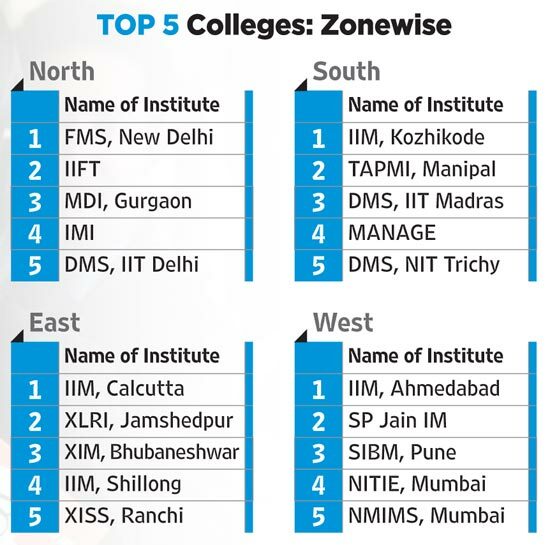 The initial task comprised drawing up a comprehensive list of B-schools across the country which offer a two-year full-time management cou­rse, and are recognised by a government body like the AICTE, NAAC and AIU. They also had to be at least five years old— with a minimum of three batches passed out—to be eligible for our rankings. Parameters and sub-par­­ameters cons­i­dered ess­ential when rat­ing a B-school have been evo­l­ved in consultation with industry expe­rts and wei­ghtages assigned accordingly. Most of the parameters and sub-parameters are unchanged from last year to ensure consiste­ncy and compara­bility. However, weighta­ges were revised upwards for parameters like incubat­ion centre/entrepreneurship cell, management dev­elopment program­mes and average package. At the same time, there is a marginally increased emphasis on research facilitation and industry exposure. 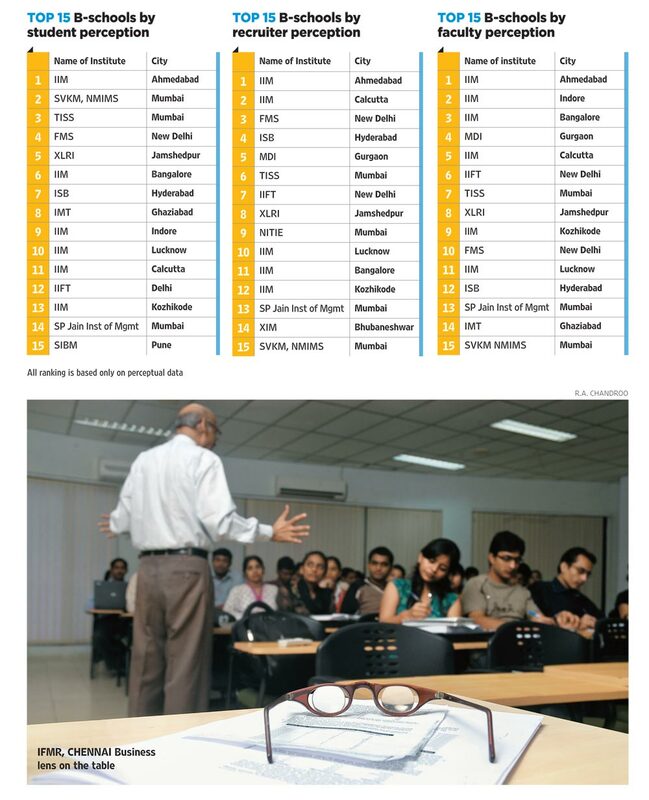 Various B-schools across India were contacted for participation—130 colleges responded, providing their objective data. This includes 24 institutes which did not participate last year. The objective survey was supported by a perceptual survey conducted among key stakeholders—students, faculty and recruiters in 14 major cities (Delhi-NCR, Mumbai, Chennai, Calcu­tta, Bangalore, Pune, Hyderabad, Ahm­edabad, Jaipur, Lucknow, Bhubaneswar, Ranchi, Bhopal and Indore). Questionnaire-based surveys were conducted on InfoMonsta—a high-speed survey platform which allowed Drshti researchers to reach 518 permanent faculty and MBA/PGDM students of various B-sch­ools. Students were asked to fill in another questionnaire reviewing their own institute; this was done to understand their outlook about their institute. In addition, perceptual ratings of B-sch­ools were obtained from 257 HR professionals. To ensure authenticity, an audit mechanism was in place involving phy­sical audits to verify the authenticity of the data provided. Trained field executives visited 40 ins­titutes for this purp­ose. Colleges that gave suspicious and questionable data were eliminated. To arrive at the final objective scores, marks obtained by colleges on the five parameters were derived on the basis of the data provided by the institutes and summed tog­ether. 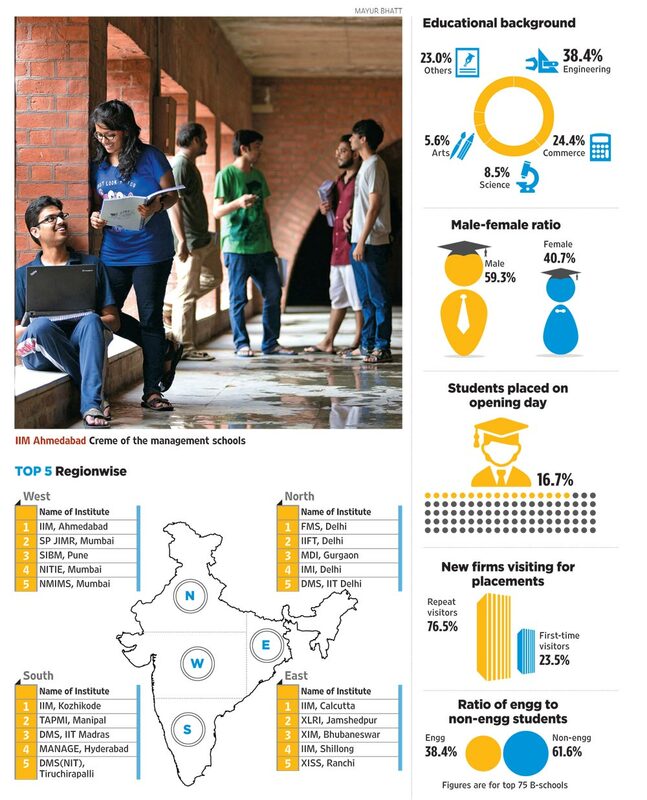 The perceptual ran­king was derived by allotting weightage of 40, 30 and 30 per cent to the perceptions of recruiters/industry professionals, faculty members and students resp­ectively. Next, to reach the final composite scores, total perceptual and objective scores were given equal weightage of 50 per cent each and the total scores were combined to arrive at the final scores and rankings. Next Story : Teacher Alert!